With the holidays just around the corner, a recent Saturday afternoon was the perfect time for The Art of Entertaining, a day of shopping, tastings and educational sessions focused on home entertaining. 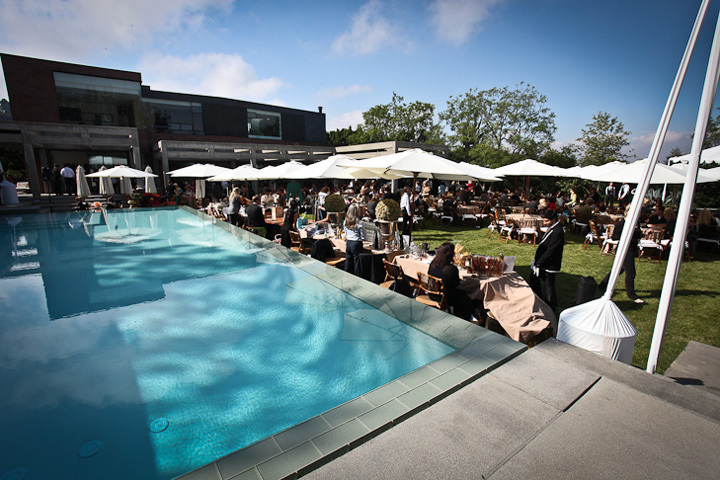 The inaugural event, presented by LA Times Magazine, was held at the Home of the Avenues, a showcase house exhibiting art, furniture, appliances and more from The Avenues, the art, fashion and design district located in West Hollywood. Throughout the event, shuttles dropped attendees off at the $17.5M Home of the Avenues, a newly-constructed, 12,000 square foot home set on a 1.5 acre lot in Bel-Air. 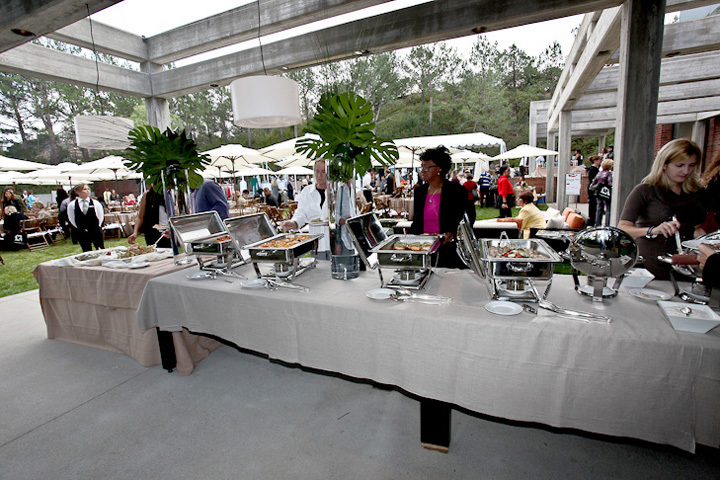 After strolling through the light-filled property, guests could shop at booths set up around the pool, featuring design and products from The Avenues. A spectacular view and hillside garden lay just beyond the dining tables. Naturally I made a beeline for the Russian Standard Vodka bar, which featured a short cocktail menu that included the classic Moscow Mule (2 oz. Russian Standard, 5 oz. ginger beer, squeeze of lime) and the refreshing Russian Rose, made with 1.5 oz. Russian Standard, 2 oz. pomegranate juice, a splash of lemon and garnished with mint. After opening remarks from the editors of LA Times Magazine, party planner Yifat Oren and floral designer Eric Buterbaugh presented their respective panels and answered questions from attendees. An extended break offered an opportunity to wander the house and check out various demos. 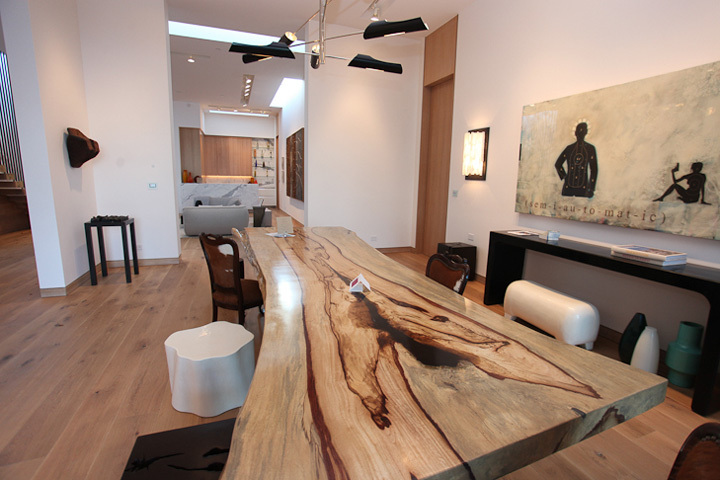 Several pieces from Seattle’s Urban Hardwoods stood out in the gallery-like spaces of the home, particularly a large dining table made from a tree that would otherwise have been discarded. Each piece of slab furniture from Urban Hardwoods is unique and offered an organic, handcrafted contrast to the sleek, modern setting. 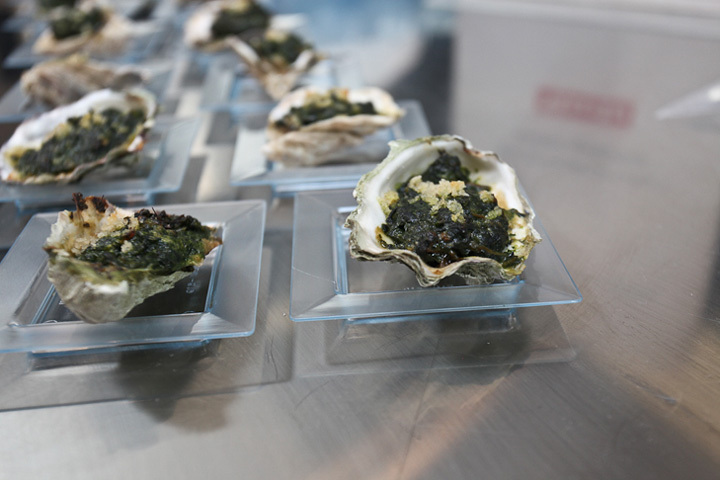 The best food of the day could be found in the Miele kitchen, where an ongoing cooking demo from Dakota Weiss (Executive Chef at The Dining Room, Hotel Shangri-La) included Oysters Rockefeller and roasted pumpkin soup topped with a drizzle of truffle oil, among other excellent bites. 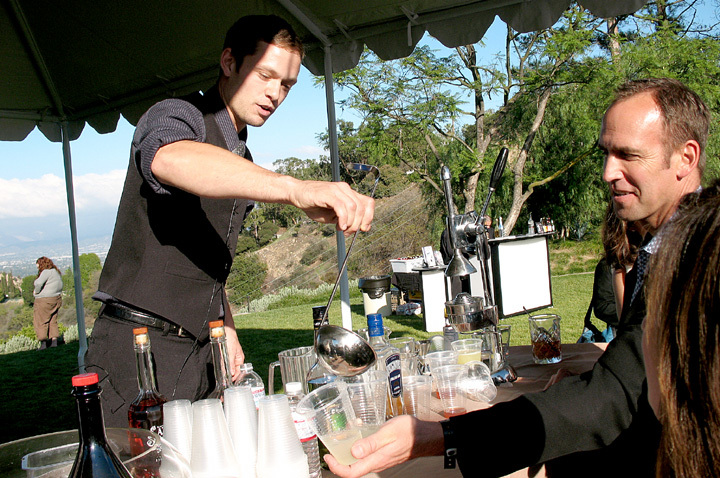 John Coltharp mixes Manhattans during his afternoon session. After the break it was time for the cocktail session with John Coltharp, who can be found behind the stick at The Tasting Kitchen a few nights a week. (The Edison’s Joe Brooke was also scheduled but wasn’t able to attend.) 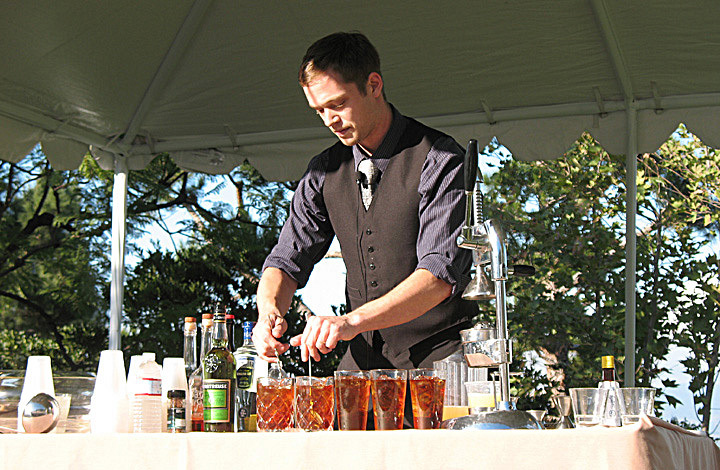 Coltharp’s first demo was a subject near and dear to my heart: how to make Manhattans. As the former Bar Manager at whiskey mecca Seven Grand, Coltharp has honed his Manhattan recipe to a fine point. The ingredients are at once accessible to the general public and approved by cocktail enthusiasts: Sazerac Rye, Carpano Antica, and Angostura Bitters. His recipe calls for a 2:1 ratio of rye to sweet vermouth, with two dashes of bitters. Coltharp talked a bit about each ingredient as he added it to the mix. Interestingly, it seemed that most of the audience wasn’t aware that vermouth shouldn’t be kept on the shelf longer than a year, and should be refrigerated after opening. A woman at my table exclaimed in mock horror that she was pretty sure there was a dusty bottle of vermouth from the 90s in her pantry. Coltharp scaled up and stirred several mixing glasses before straining into cups for attendees to sample. John Coltharp serves his punch to thirsty attendees. Next was a punch recipe with Plymouth Gin, Green Chartreuse, fresh lemon juice, and simple syrup. Coltharp combined the ingredients in a punch bowl that held a large block of ice, which he’d created by freezing water in a plastic container. He added some cinnamon sticks and stirred. The result was a nicely balanced punch that had depth without being overly tart. Best of all, preparation only took a few minutes, a definite plus for any party host. 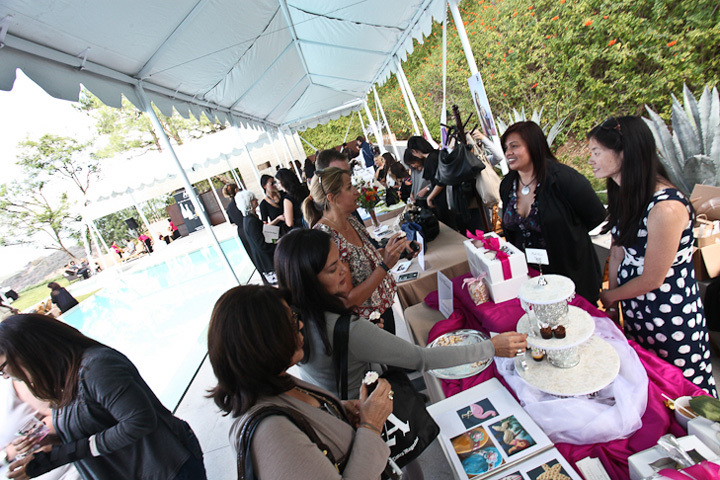 For more information about The Art of Entertaining, visit events.latimes.com/artofentertaining/general-information. For details about the Home of the Avenues: roseandchang.com/3350stoneridge. Disclosure: admission to the event was provided by LA Times Magazine.